Today was the running of the Marine Corps Marathon. Since the Mary, Queen of Caffeine, was running, I knew there was just one thing to do: ride to the marathon and have some coffee en route. And so I did. I hopped on The Mule and headed up the Mount Vernon Trail despite the fact that my legs are pretty much toast after two weeks of biking commutes, event rides, and a hike. I stopped in at Firehook Bakery on Washington Street in Old Town for a coffee and everything bar (it was a blondie with all kinds of other stuff in it, coconut, pumpkin, and maybe some meth). The coffee was okay. After drinking half of it, I put the cup in my waterbottle cage and set off for my marathon watching perch at the Virginia end of the 14th Street Bridge at around mile 21. When I got there the runners were thick and moving pretty fast. I didn’t know what Mary was wearing so spotting her was sure to be a challenge. I checked my Twitter feed and found out that Ed, King of Caffeine, had spotted her at mile 20 some 30 minutes earlier. Oops. I hopped on the bike and headed for mile 25 or so. This was at the northern end of the vast Pentagon parking lot. As I was about to ride a road down to the race course, a Pentagon Security Officer told me that the area was off limits. I literally said, “You’re kidding me, right?” Nope. I have watched the marathon from this very spot over a dozen times in the past. There was, of course, absolutely nothing about this vantage point that was in need of security any more than the other 26.2 miles of the course. There were even people already lined up along the road! Still Mr. Security would not budge. Whoever made the security decisions or empower this knucklehead to enforce them really needs to find another job. Maybe they can put him on the ebola watch. I rode away and was soon perched along side the course near mile 26 with hundreds of other folks causing security mayhem by cheering on friends and family. I even found Ed who told me that Mary was wearing a red Washington Nationals shirt. (Most excellent fashion choice!) Despite now knowing what to look for I managed not to see her run past. About 30 minutes later Ed tweeted that she had finished in 4:29:50. Bravo, Mary. I recommend a warm beverage in celebration. Drink: House brew with super duper blondie bar. Bar was better than coffee. Observation: It was a good thing I didn’t have two cups of coffee or I might have told the cop to go eff himself causing me to become the first incarcerated coffeeneur. 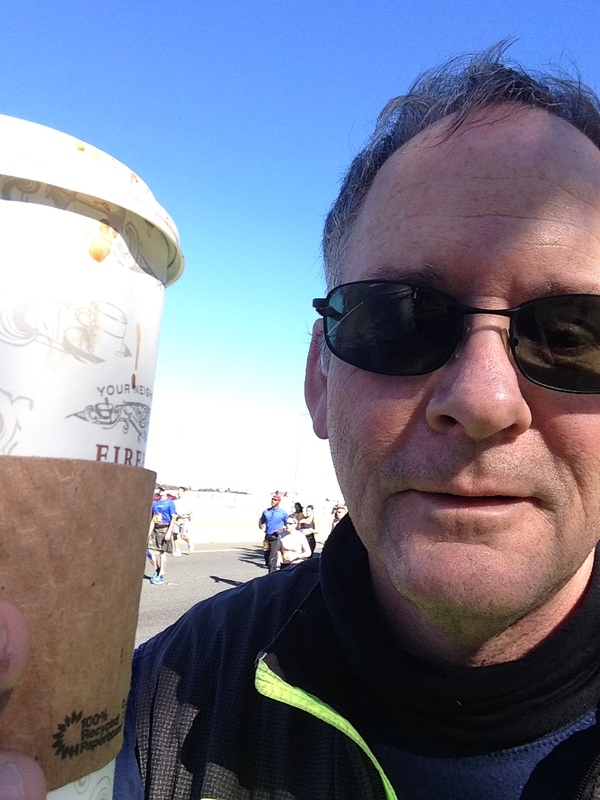 Posted on October 27, 2014 October 26, 2014 by rootchopperPosted in CoffeeneuringTagged coffeeneuring, Marine Corps Marathon. Thanks for being out there, Rootchopper! It was a glorious day out there, AND I’m glad you were not the first incarcerated coffeeneur.